If we were really going to do Meya Bizer justice, we would have found someone for her to tackle. Alumni Association members will find Bizer on page 23 of our Jan/Feb 2015 issue, where she’s the lead story in our sports section. She’s a senior and star on Penn State’s powerhouse women’s rugby team, winners of the last three national collegiate championships and nine titles overall. The consensus college player of the year in each of the past two seasons, she’s also the youngest member of the U.S. women’s national rugby team. But about that photo on page 23: There’s Bizer in full stride, pitching a perfect pass at (or, hopefully, just above) our photographer’s camera. Bizer is an all-around talent, so we might accurately have shown her displaying all sorts of rugby skills. But if we’d really wanted to capture what sets her apart, we would have convinced some poor, unwitting soul to let Bizer use them as a tackling dummy. We could have volunteered ourselves, of course. But we know better. The hit against West Chester, around the :55 mark? You can feel that one through your screen. With form that Nittany Lion linebackers might envy, Bizer has become the biggest hitter in her sport. The gridiron comparison is intentional: Bizer went out for football in middle school, was the placekicker on her high school team and even earned a scholarship to play for the University of St. Mary, a tiny college in Kansas. But along the way she fell in love with rugby, ultimately transferring to Penn State for a chance to be a part of the Lions’ burgeoning dynasty. Bizer was her typically dominant self last month as Penn State hammered rival Norwich to win the USA Rugby Division I fall championship. The Lions are heavy favorites for a 10th national title this spring, and while Bizer isn’t the only reason—the Penn State roster is loaded with talent—she’s probably the biggest. Certainly, she’s the most impactful. Entry filed under: From the Magazine. 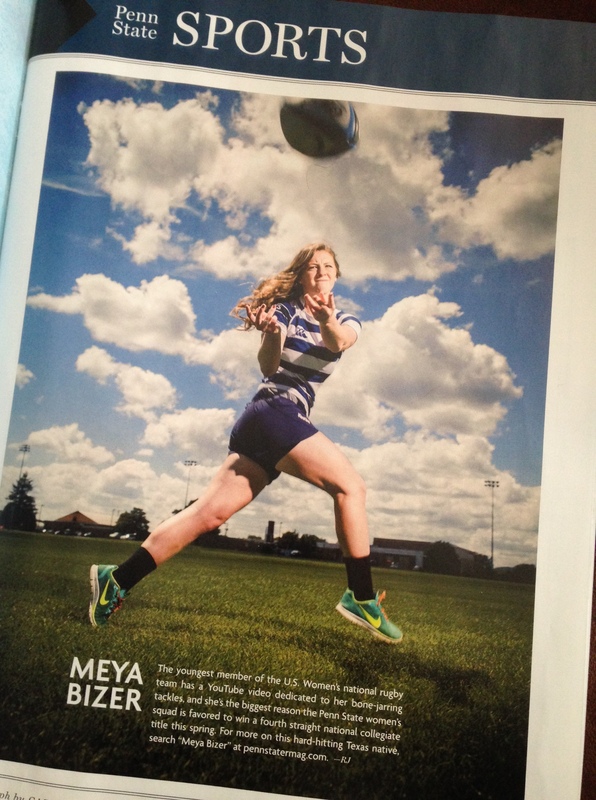 Tags: Meya Bizer, Women's Rugby.